If you are using WooCommerce plugin to operate your ecommerce site, you will need to install our WooCommerce Reviews integration add-on, which integrates WPRichSnippets user reviews into your products pages and across your site. Check the WooCommerce Reviews Demo site. Note: This add-on require WPRichSnippets (WPRS) core plugin to be installed and activated on your WordPress website. In the plugin WPRS plugin general settings, make sure to enable WPRS on Product post type. Users must choose a rating? Enable users to submit reviews via a popup form? License key can be found in your account, this is important to get automatic plugin updates. Votes: user star rating votes. Use this feature to update and enable user reviews on all product pages at once. Mostly, you will need to use this feature only one time when you first install the plugin, but we left this option here in case you need it in the future if you ever need to switch between review types. Note: It’s highly recommended to backup your database before updating your products info. 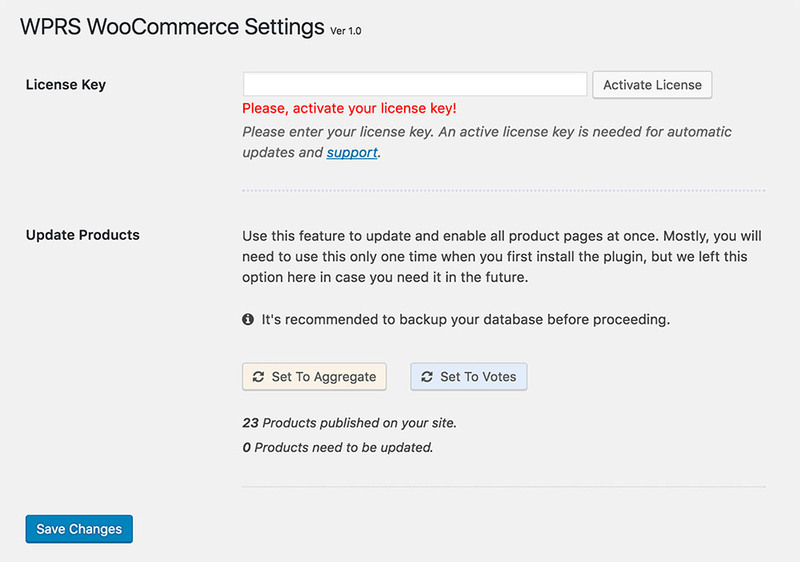 Go to WooCommerce > Settings > Products, then disable product ratings. WPRichSnippets plugin has support for more than one type of reviews, so we created an advanced Review Widget that you can customize in several different ways. You may need to remove WooCommerce’s reviews widgets if you are using any. Instead use the Review Widget. You can use more than once instance of the Review Widget to configure each instant to display recent reviews and top reviews. Now that you are done with configuring the plugin, reviews should be functioning on your online store.